Photographing kids can be extremely difficult! Every time I visit my family I try to get cute pictures of all the kids. Sometimes it's hopeless, sometimes I get a few good ones, and other times I get a lot of good ones! This photo shoot we had to bribe with candy, cheetos, and toys. I think it worked out well. 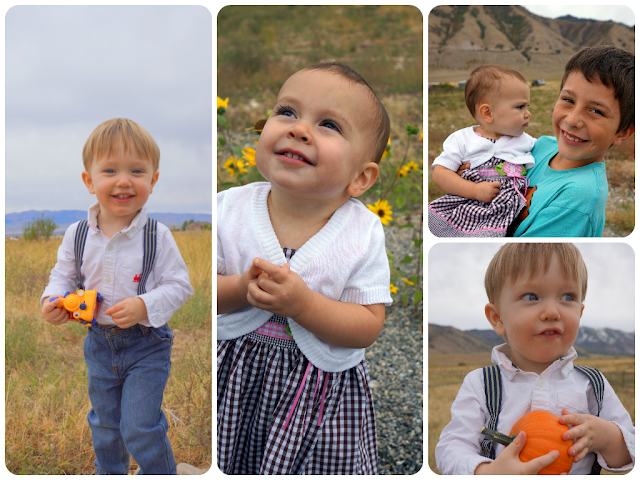 Here is the advice I have for trying to get cute pictures of kids who don't want to cooperate! 1- You don't need to travel far from home to get nice pictures. We took these in my brother's neighborhood, because we didn't want the kids to have to sit in a car or get fussy before we started. I love this picture of my cute little Rue standing by the neighbor's fence with the mountains in the background. Or this picture of cutie Ez holding his toy and looking happy as can be. He's smiling because he has his toy, not because he likes to cooperate!! 2- PROPS! I grabbed this baby pumpkin off my Brother's porch at first I thought I could use it to distract the kids into smiling, but then I thought "hey it is fall they might as well hold it". And they do look super cute holding it in the pictures! Especially Ruby who kept calling it an apple! 3- Take candid shots. There are SO many cute photos out there that are completely staged. I'm a little jealous because I don't know how people get a toddler to look, and smile, and play with the right item to create the perfect photo. I'm not a professional, so maybe there is a secret, but I've had to learn that candid photos are just as cute as the super staged cute photos. That doesn't mean I won't give up trying to get that perfectly staged shot. I just have to work harder by running around, getting different angles, and always having my camera on and ready to capture the cute little moments.